The hysterical husky’s sharp molars were shearing the dogsled’s towline right behind the lead dogs. “Meeter, no! No! NO!” I yelled, but too late. The team had to wait with escalating impatience while I got off the sled, walked up and knotted the frayed lines. With young dogs and ex-race dogs filling out the team, it was shaping up to be an interesting trip on the line. My sister, Miki, already had taken a full team of mostly seasoned dogs out to open cabins and set 65 miles of trail along our remote Alaskan trapline. Meeter had gone on that two-week trek and should have been settled by now, but clearly was not. Yesterday’s run to this first line cabin had been so fast I worried the dogs might burn out. They were so wired I had to tip the loaded sled over to hold them at each stop. We did set a 15-mile run through swamps and taiga, but I felt almost lucky to have a dry run today, because the dogs wouldn’t have to behave while I stopped to make sets. We value big, tough, laid-back huskies for trapping. But such sled dogs are a rare commodity these days, when most mushers demand speed. 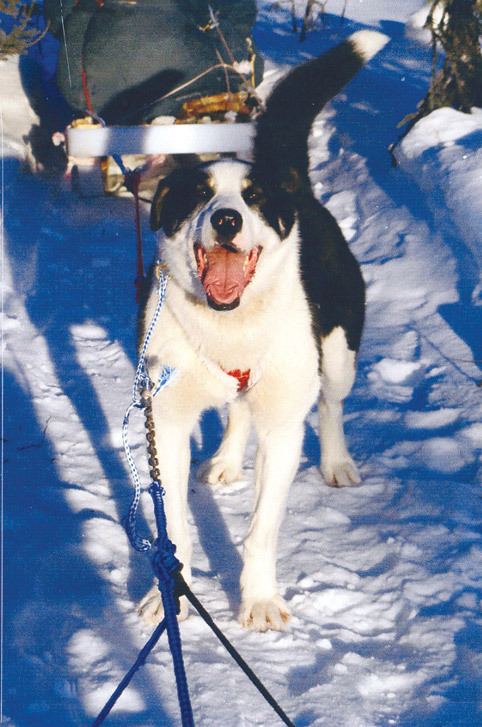 Today’s intense 30- to 60-pound sled dogs don’t much resemble our heavy-coated, big-boned working dogs. But this year, to replace retiring dogs, we had added Coco, a larger ex-race dog; and Dragon, a spindly youngster from another racing line. Combining the pair with two enthusiastic yearling offspring of my main leader, Jiles, left me with my hands full. Leaving Kraki and Coco loose to slow the team on the rough November trail, I ran Jiles and Keta in lead, young Dragon and Meeter in swing, the brothers Fiji and Tokelau in the team position, and powerful Spoi in wheel in front of the sled. It should have been a strong, efficient team. Certainly, the six I’d been training while Miki went trapping had clicked really well. But now something was wrong. The dogs just didn’t mesh with the three I’d added from Miki’s team. Keta lacked impulsion and kept falling back; Meeter pulled so hard he overtook the leaders. Dragon repeatedly tangled in the slack lines. Every time I stopped to work a trap set or to untangle dogs, Meeter went ballistic, barking and lunging. I had worked hard to train the youngsters to remain calm during stops, but with Meeter egging them on, they reverted to puppyhood. On top of that, light snow cover made for rough sledding, with exposed muskeg and sharp creek banks. I also feared the lack of seasonal snow cover had stressed the voles and other small creatures that marten prey on, which could hurt the catch. Because of the young dogs, I planned just a 10-mile run this day with an overnight stop at a small tent camp. Three miles short of that camp, I stopped to pick up the first marten. It was taken in a No. 1-1/2 longspring at a cubby set baited with rotten fish, like most of our catch . We also use moose gut for bait. Sets are lured with a blend of castor, anise or peppermint mixed with glycerin to keep it fluid in the Arctic cold. After stowing the marten, I walked up to straighten out yet another tangle. Having waited for all of three minutes, Meeter had become positively frantic, screaming and harness-banging. He pumped up the youngsters to insane levels, and before I got the lines straight, they pulled loose the snow hook that anchored the sled and charged joyfully forward. I grabbed the towline, fell, dragged, slid under the sled, shrieked and shouted until the dogs stopped to see what was wrong. Or to laugh at me; I’m not sure which. But I’d had enough. I turned Fiji loose and moved Dragon back to Fiji’s spot where he was less likely to tangle. I turned Meeter loose, moved Keta back to Dragon’s spot, and put Coco in beside Spoi. That left Jiles in single lead, which he didn’t like, but now Keta could work better and wouldn’t get tangled. We slowed yet had a clean run into camp, and even picked up another marten along the way. In the morning, I put Meeter in wheel where he wouldn’t get tangled. A heavy-gauge wire twisted around the towline discouraged his chewing, a bit, and we had a pretty nice run to the West Line cabin. Three more marten brought the catch up to five. With no roads in the vicinity, our dog food has to be shipped in by air, and a 40-pound bag costs almost $80, so I was glad to catch steady if unexciting numbers of marten, to help with the feed bill if nothing else. A day at the cabin gave me a chance to thaw and skin the marten. Then I hiked the first mile of tomorrow’s trail, baiting sets so I wouldn’t have to stop the dogs every quarter-mile while they were still in jet mode. The trek took me through a frosty 40-year-old burn with willow and birch saplings that harbored many bunnies. We found abundant lynx and even the occasional wolverine along this stretch. I prefer to pack these bigger critters back to the West Line cabin instead of hauling them cross-country to the Spruce Cabin, especially when the dogsled already carries a full load. Unfortunately, the cats here are a single shade of silty brown, which cuts their value in half. We keep most of them, selling some pelts to taxidermists and tourists as well as making some into hats and mittens to increase the payback. With hare numbers high and cats everywhere, we would catch enough lynx that winter to add more than 100 pounds of nutritious cat meat to the dog pot, but my hike that day came up dry. We often have trouble with sore-backed dogs due to rough trails in early winter, before the dogs have hardened to the work. Plenty of rest days help, as does rotating wheel dogs from that strenuous position. Unfortunately, that meant I’d be leaving Meeter loose instead of in wheel for the 15-mile run over to the Spruce Cabin, and Spoi took his place in wheel. Meeter won’t quit when he’s hooked in the team, but he likes to play when he’s loose. He rarely runs politely ahead or behind as most loose dogs do, choosing instead to harass the lead dogs, blocking the front of the team. I would have preferred to harness him in the team position in front of the wheel dogs, but that easy spot went to the young dogs. With Meeter hounding and tripping the leaders, I found myself once again untangling dogs and trading them around, trying to find an arrangement that worked. Miki’s leader-in-training, Kraki, worked well beside Jiles, but the first miles were frustrating. When young Fiji got tired, I turned him loose and put Meeter in. That solved my problems—until Fiji stepped into a marten trap. It was an ideal setup to teach a young dog about traps; usually one toe-pinching teaches them that I can rescue them, if they calm down and trust me. Hopefully, the dog also learns not to mess with trap sets, even if the rotten fish bait smells luscious. In this case, Fiji learned the second lesson but not the first, because when he started screaming for help, my wonderful dog team folded back on itself to reach him and see what the trouble might be. By the time I wrestled them under control and untangled the ropes, Fiji had pulled out of the little No. 1 longspring by himself. Later, Jiles jumped a live marten in a trap and the whole team piled on again. Most leaders know better and will drag the team nicely past. Jiles had picked up this terrible behavior from his original mentor, old Lance, who had never learned trapline etiquette. Now, to my disgust, Jiles was passing on the vice to this young team. I arrived in camp tired and feeling frustrated with the dogs, but pleased to have picked up nine more marten. Dragon had developed gut problems and quit eating. I was so fed up with Meeter I left him behind with Dragon the next day as I ran a 15-mile loop out of the cabin. Despite the minus 24 chill, my seven-dog team and I enjoyed a lovely, easy run. Everyone stayed in line, worked well, and cooperated. Even Fiji, toughening up, managed to pull nicely the whole way. We added six more marten to the growing pile, and then I took a day off to rest and skin furs while waiting for minus-30 weather to moderate. In order to stay on a schedule that ensured Miki and I’d be home together for Christmas, I had to make the three-day run home without further delay. I knew the dogs could do it, but with the rough trails and their inexperience, they might not enjoy it. Coco and Meeter together had nearly chewed apart the half-inch poly rope that made up the wheel section of towline, so I replaced it with an old hunk of green rope. My wheel dogs wouldn’t have necklines, but that probably didn’t matter. Three miles into our three-day journey home, we rolled down a muskeg flat that edged Whisper Creek and then turned to make the creek crossing. The dogs burst through the brush edging the creek and almost crashed into a wolverine trapped at a set beside the creek. He was a big brown dude, one of the biggest we’d ever caught, pinched in a stout No. 2 single-spring that we’d inherited with the trapline in the 1970s. “Jiles, no! No! NO!” I bellowed. The dogs, thinking they’d caught one big marten, all piled onto the snarling bundle of energy. But then, just as quickly, they recoiled, rolled back and tumbled in a massive ball down to the creek ice. There they stood in a tangled heap, staring bug-eyed at the dervish from a safe distance. The wolverine, freshly nabbed by one toe, was in a fury. Luckily, the four feet of 1/8-inch aircraft cable that secured the trap to the tree had given him enough room to play so he hadn’t pulled out. I shot him in the neck with my .44 and was disgruntled to later discover that although the bullet killed him instantly, it did not penetrate the body—and this was my bear gun. After untangling the dogs and snubbing them in line, I dragged the wolverine down on the creek ice to show him off. Allowing the dogs to sniff for as long as they show interest helps desensitize them, making them less aggressive toward furs and fur animals. Intimidated, at first, the pups soon joined the older dogs in rolling delightedly on the rank-scented beast. 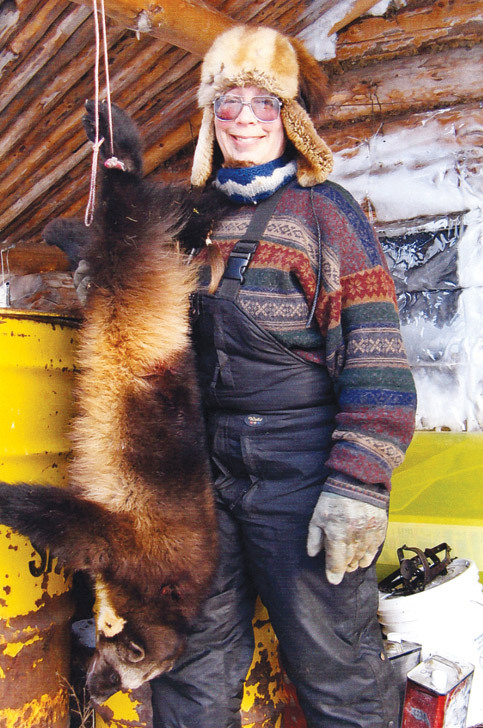 I stayed up late that night at the West Line camp, carefully skinning the big wolverine, impressed by his size and the deep, mostly healed scars on his head. I was disappointed with the flat brown color, and he lacked the white diamond marking found on select furs. The big skull with its perfect, pearly teeth would bring a good price, though. Expecting a day off, the dogs looked surprised at being hooked up the next morning. Still, Meeter whipped them into a raging frenzy from his wheel position, and they were barking and lunging like a race team. For once, I was glad to see the dogs eager to go, because a few yards from the cabin we had to cross a 10-foot span of thin ice and shin-deep water on the Little Shell. I’d thrown some snow onto the half-sunken ice, making it appear stronger so the leaders would make the crossing. But I worried about the youngsters balking at the water’s edge. We’d just hit top speed when my leaders sailed over the water, breaking ice without losing impulsion. “Go across! Go across!” I shouted cheerfully. The rest of the dogs, held in place with necklines, bounced along after Jiles and Kraki. Without a neckline, he felt free to dodge the water, and he did so without warning, darting around the wrong side of a snow-laden spruce. The momentum of the team jerked his tugline instantly tight, snubbing him against the tree. I gripped the handlebow tightly as my feet slid off behind. Dragged by his harness, Meeter slithered around the tree upside-down and backwards, into the water and up the bank before he regained his footing. I fell to my knees then on my face in the snow, still gripping the handlebow. “Go ahead!” I muffed into the snow. The sled splashed into the water, dragging me behind. Like Meeter, I slithered through then up the bank. Unlike him, I couldn’t regain my footing. “Whoa!” I ordered, and this time they stopped. I staggered to my feet and paused to survey the damage. My face and feet were icy; water had penetrated the gaps in my clothes at waist and neck. Luckily, the temperature had topped zero for the first time in 10 days, so I decided to run on down to the tent camp and dry off. On the last day, I put my race dog Coco in front beside Jiles with Meeter in wheel. On a familiar trail, we cruised on home in good time. Twenty-six marten and one wolverine made the trip profitable, and with Meeter in wheel and the new dogs gaining experience, I felt the team finally starting to come together. 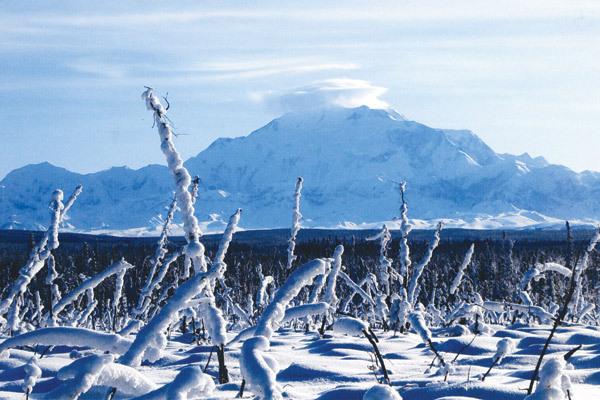 Miki and Julie Collins have run a 70-mile trapline in wilderness Alaska since 1979. Their books can be mail ordered by writing to M&J Collins, P.O. Box 69, Lake Minchumina, AK 99757.